I’ve read and loved several of Mandy’s books now, she’s got that light-hearted and fun read thing down to a pat, with characters that feel real and plots that aren’t totally improbable but could really happen. I love that, a story you feel could very well be real. This is a fun read, but not my favourite – but still a great escape from reality for a while and I adored Julien. So Ava is escaping, running from her cheating ex, hiding from her somewhat overbearing mum. She runs a model agency and has been putting Ava though her paces out in front of the camera since she was just four. Ava loves her mum but feels pushed into modelling, its not her choice, not what she wants to do but her mum ( AKA Rhona Rhinestone by Ava and Debs!!) is something of a steam roller, always pushing her to lose weight, stand tall, do yet another fast, try the latest beauty regime, things like that. Poor Ava is 24 ( I think) now and yet still can’t stand up to her. Her parents are divorced and best friend Debs mum and stepdad have been a friendly, accepting substitute, embracing her with all the love they have for Debs, welcoming her to all the family get together, showering her with treats, lovely fattening food, lifts everywhere – in fact Ava calls stepdad Gary TaxiDad. Paris is wonderful, Ava adores it but she’s also still ignoring calls and the increasingly frantic texts and emails from her mum, along with texts from Leo, the cheating ex. I love Ava, she just doesn’t want o upset her mum, but can’t seem to get through to her that she Just Doesn’t Want to Model….she’s done all sorts, faked illnesses, claimed spots, eaten loads to put on weight, anything rather than force mum to see she doesn’t want to do it, as she feels it will upset her, and despite everything she does love her. Rhona is one of those ladies who don’t really listen, convinced they know best, and just steamroller over others without intending to upset or cause problems. She seems to think Ava enjoys modelling but needs a push to do more. There they are in Paris when Debs finally spills what’s been upsetting her – she and her mum think Stepdad Gary is cheating, her mum says he’s become secretive, and there are odd phone calls. Debs just can’t believe it, that’s what her dad did, and Gary has always promised never to hurt them both that way. She knows the lady her mum thinks he’s with works in the Paris office, and she and Ava try to check her out, not always legally! Right on the first night they meet Julien, a photographer and Didier his friend. That first meeting doesn’t go well, Julian had his own grief from the death of his sister only a year back, which has fragmented his family. He’s been really depressed, has been dragged out this evening by Didier, and doesn’t know why he’s brought the camera, he’s not used it since Laurens death, it all seems so pointless. Then he sees Ava, in an angry phone call to Leo, full of fire and anger and life, and after the call is over she seems to just let the surroundings flow into her, absorb the beauty and he’s snapping away before he realises what he’s doing. Ava is furious, another bloody photographer, snapping away and surely picking holes in her appearance or her stature as they always do, making her feel never quite up to scratch. Of course its not like that and the two are persuaded into the cafe by their friends and eat while talking over their differences. Julien finds himself offering to show Ava Paris the next morning and from there things grow like a whirlwind. There’s Debs and her issues, Ava and her ex and mum problems, Julien, grieving, as are his family and struggling to pick up life, the irrepressible Didier. As the story goes on these characters get brought in and moulded together, and the story just grows and grows. Its full of fun and misunderstandings, tracks the reader is pulled along that turn out to be something else, reading people and then seeing them from a different view, and finding that everything isn’t just black or white. 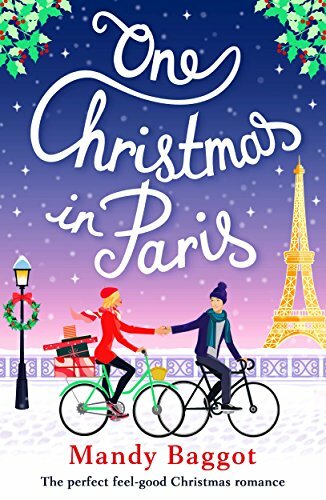 Its a fabulous read, I loved the descriptions of Paris, of the food (chocolate croissants – yes, but Not snail butter….) of the people. Mandy takes all these issues, trails them together, throws in more and somehow melds them all into a wonderfully satisfying story once more. Stars: four – a real feel-good Christmassy read.